Born in 1959 in a Latvian village by the stream where the White-throated Dippers winter. Graduated in 1986 from the Faculty of Biology of the Latvian University. Full time photographer since 1987. Works for various magazines and publishers taking photos of almost exclusively nature. 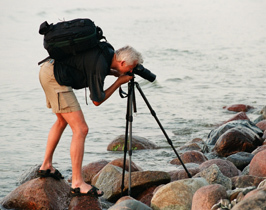 Author of photos in numerous books and calendars published in Baltic States. Author of 6 exhibitions. Winner of Fujifilm Euro Press Professional Awards in 2006. All the photos here are taken in Latvia as well as Scandinavian countries.